Soldering tip 508-351-Т5, slotted screwdriver, with notch Soldering tip 508-351-T5 tipped tipped straight screwdriver with 5 mm diameter dense base. 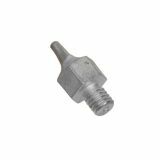 Soldering tip 508-351-Т4, cone, with notch Soldering tip 508-351-T4 with conical shaped tip with a snap and compact base with a diameter of 5 mm. Soldering tip 508-351-Т2, cone, with notch Soldering tip 508-351-T2 with conical shaped tip with a snap and compact base with a diameter of 5 mm. Soldering tip SIN2-26, cone, hollow Soldering tip SIN2-26 with cone shape and tip diameter 1 mm. Suitable for soldering stations ZD-919 and ZD-929. Soldering tip 40W, cone 40 W soldering tip with elongated cone tip and elongated base. Soldering tip 100W-BG 100W-BG Soldering tip with slotted screwdriver shape. List Price 7.99лв. VAT Incl. 7.59лв. VAT Incl. Soldering tip 5SI-131-B, cone Soldering tip 5SI-131-B with cone tip shape and hollow shank with inner diameter 5.8 mm and outer 8.1 mm. 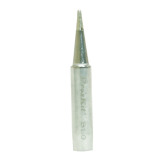 Soldering tip 5SI-131-2C, sloped cone, hollow shank Soldering tip 5SI-131-2C with sloped cone tip shape and hollow shank with inner diameter 5.8 mm and outer diameter 8.1 mm. 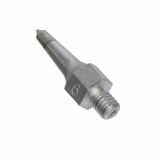 Soldering tip 5SI-131-3C, sloped cone, hollow shank Soldering tip 5SI-131-3C with sloped cone tip shape and hollow shank with inner diameter 5.8 mm and outer 8.1 mm. Soldering tip 5SI-216N-B1.0, cone, hollow shank Soldering tip 5SI-216N-B1.0 cone shape, hollow shank with inner diameter 4 mm and outer diameter 6.3 mm. Soldering tip 5SI-216N-3.2D, chisel, hollow shank Soldering tip 5SI-216N-3.2D with slotted screwdriver tip and hollow shank with inner diameter 4 mm and outer diameter 6.3 mm. Soldering tip 5SI-216N-1.6D, chisel, hollow Soldering tip 5SI-216N-1.6D with chisel tip shape and hollow shank with inner diameter 4 mm and outer 6.3 mm. 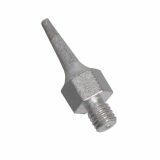 Soldering tip 5SI-216N-2.4D, chisel, hollow Soldering tip 5SI-216N-2.4D with tip shape as a slotted screwdriver and hollow shank with inner diameter 4 mm and outer diameter 6.3 mm. Soldering tip 5SI-216N-1.2D, chisel, hollow Soldering tip 5SI-216N-1.2D with chisel tip shape and hollow shank with inner diameter 4 mm and outer 6.3 mm. Soldering tip 30 W, cone, 3.5 mm 30 W soldering tip with extended cone tip and 3.5 mm long base extension. Soldering tip, cone, 3mm Soldering tip with cone tip shape and shank with diameter 3 mm. Soldering tip WELLER DS110, threaded Soldering tip WELLER DS110 with cone tip shape and threaded shank. Soldering tip WELLER DS111, threaded Soldering tip WELLER DS111 with cone tip shape and threaded shank. Soldering tip WELLER DS115, threaded Soldering tip WELLER DS115 with cone tip shape and threaded shank. Soldering tip WELLER DS116, threaded Soldering tip WELLER DS116 with cone tip shape and threaded shank.